And so it begins! 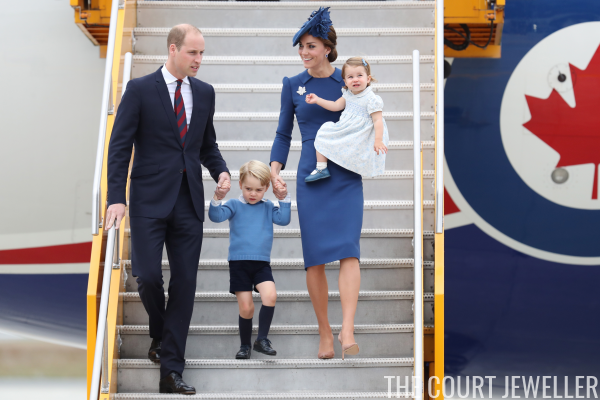 The Duke and Duchess of Cambridge, with Prince George and Princess Charlotte, have arrived in British Columbia to embark on a tour of Canada. We'll be following all of Kate's jewelry here during the tour, and we've got a great couple of pieces to kick things off. 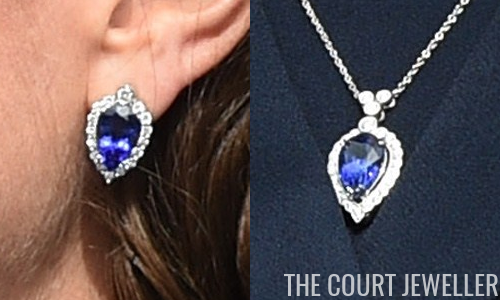 Kate chose her diamond and tanzanite earrings from Collins and Sons for the arrival. The vivid blue of the tanzanites pairs perfectly with her royal blue dress and hat (which, naturally, is festooned with maple leaves). Here's a close look at the earrings, plus the coordinating necklace from the suite. You can read our extensive post on the set over here. 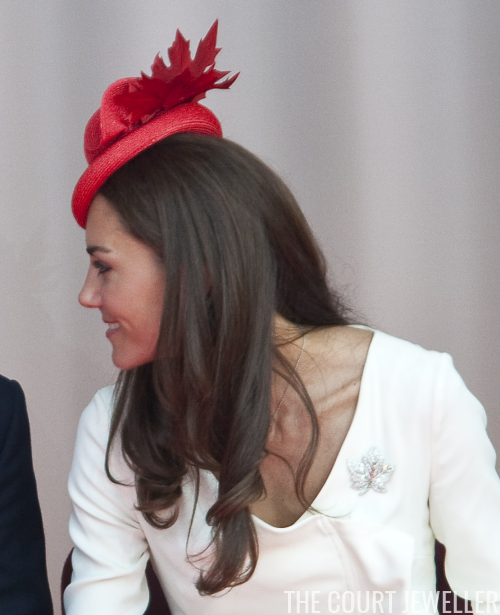 For the second time, the Queen has loaned Kate a piece of jewelry with a very Canadian connection: the Diamond Maple Leaf Brooch that belonged to the Queen Mother. Made by Asprey, the brooch was a gift to the Queen Mum from her husband, King George VI, in 1939. The gift was in commemoration of their 1939 tour of Canada; the Queen Mum wore it for the first time during their Atlantic crossing. 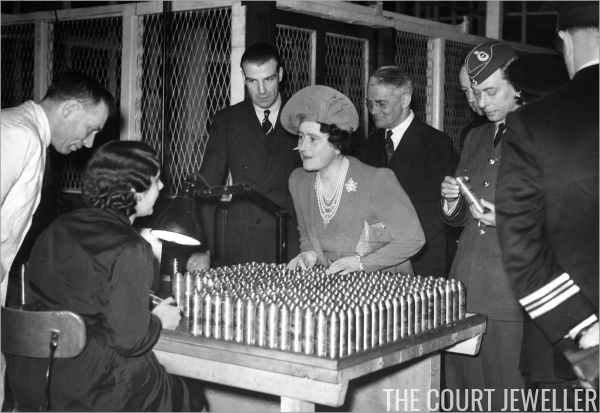 Above, the Queen Mum wears the brooch in April 1940, shortly after the outbreak of World War II, during a visit to an ammunition factory. She kept and wore the brooch throughout her lifetime, and it was inherited by the Queen in 2002. Since then, the Queen has loaned the piece to both the Duchess of Cornwall and the Duchess of Cambridge. 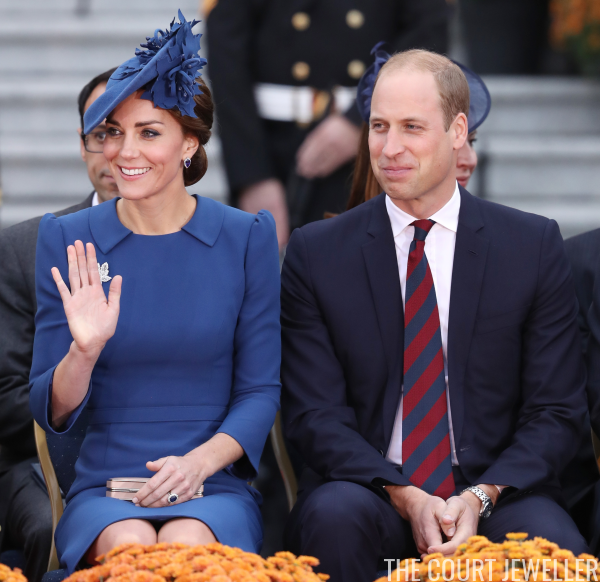 Kate wore the brooch multiple times during the Cambridges' last tour of Canada, which took place shortly after their wedding in the summer of 2011. Above, she wears the brooch (and another maple-leaf themed hat) in Ottawa on Canada Day. 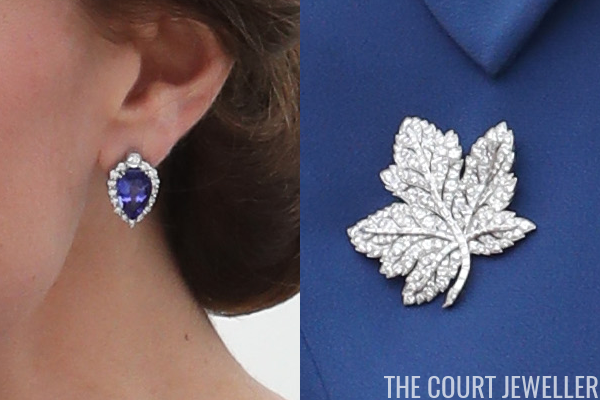 You can read more about the Maple Leaf Brooch in our post here. 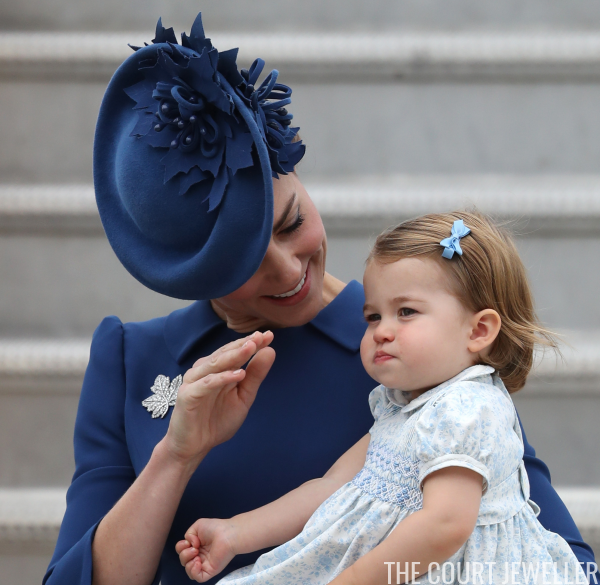 In one of my favorite images from the airport arrival, Princess Charlotte reached out to grasp her great-great-grandmother's brooch. 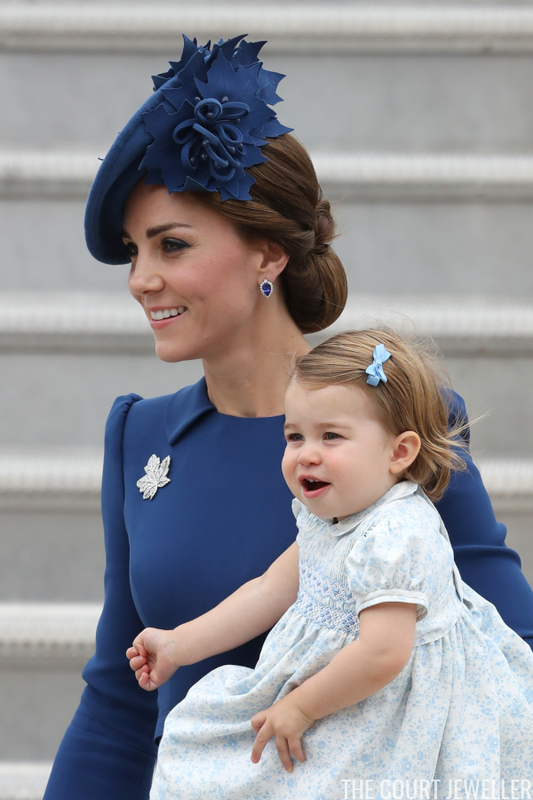 At the official welcome ceremony in Victoria, Kate wore the same outfit and jewelry. Her wedding and engagement rings were also visible. Here's a closer look at both major jewelry pieces from today's arrival. I give the entire look a thumbs-up -- how about you?